Oxygen therapy may be defined as the administration of oxygen to a patient at an inspired concentration greater than that of oxygen concentration in ambient air. Oxygen therapy is one of the important parts of therapy for treating hypoxemia and widely used across a whole range of specialties. Oxygen is a drug. It should not be given, it should be prescribed. So, it mandates to be used cautiously but also no patient should be devoid of it when required and indicated [1Austin MA, Wills KE, Blizzard L, Walters EH, Wood-Baker R. Effect of high flow oxygen on mortality in chronic obstructive pulmonary disease patients in prehospital setting: randomised controlled trial. BMJ 2010; 341: c5462. [http://dx.doi.org/10.1136/bmj.c5462] [PMID: 20959284] -3Girardis M, Busani S, Damiani E, et al. Effect of conservative vs conventional oxygen therapy on mortality among patients in an intensive care unit. The oxygen-icu randomized clinical trial. JAMA 2016; 316(15): 1583-9. [http://dx.doi.org/10.1001/jama.2016.11993] [PMID: 27706466] ]. This requires understanding of the oxygen delivery devices itself and thus the correct use of various gadgets available in oxygen therapy armamentarium [4John E, Heffner JE. Story of Oxygen Respiratory Care 2013; 58: 18-31. 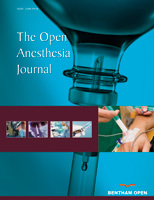 [http://dx.doi.org/10.4187/respcare.01831] [PMID: 23271817] , 5Conte BM, L’hermite JM, Ripart J, Lefrant J. Perioperative optimization of oxygen delivery. Transfus Altern Transfus Med 2010; 11(3): 22-9. There is a wide range of oxygen delivery devices broadly divided into the low flow oxygen devices and the high flow oxygen devices Table 1. The low flow devices consist of the nasal cannula, simple face mask, partial rebreathing mask and the non-rebreathing mask. The high flow oxygen delivery devices consist of venturi masks, oxygen tent and oxygen hood. Nasal cannulas are most commonly used in our day to day practice. Usually, patients are more comfortable with the nasal cannula but we should keep in mind if the fraction of inspired oxygen (FiO2) delivered by the nasal cannula is sufficient for the patient. The maximum fraction of inspired oxygen (FiO2) provided by the nasal cannula is 0.44 at flow of 6 L/min. With further increase in flow, there is no further increase in FiO2.Appropriate devices and flow rates should be used in order to achieve target range of oxygen saturation for the patient. Prolonged use of nasal cannula may lead to drying of mucosa and crusting of secretions and may lead to epistaxis. Simple face mask provides an additional reservoir of 100-200mL of oxygen. It can provide a FiO2of up to 0.6 to the patient. The flow rate must be a minimum of 5 L/min to prevent rebreathing and prevent carbon dioxide (CO2) accumulation. It has an advantage of being light weight and simple to use but it needs to be removed while eating and speaking. It is difficult to get a proper seal in patients with Ryle’s tube. It cannot be used in patients with facial injury and burns. If the face mask moves up accidentally towards the eyes, then it may lead to irritation and dryness of eyes. Partial rebreathing and non-rebreathing masks have reservoir bag attached to the mask which provides additional reservoir volume. In partial rebreathing masks, as the name suggests some amount of rebreathing is allowed. Exhaled oxygen from the anatomic dead space which does not take part in gas exchange gets collected in the reservoir bag. This is especially helpful in situations where oxygen supply is less and conservation of oxygen would be helpful. Partial rebreathing mask delivers a FiO2 between 0.6 and 0.8. Reservoir bag must remain inflated throughout to ensure the delivery of highest FiO2 with adequate CO2 evacuation. For this, fresh gas flows of more than 8 L/min is required. Non-rebreathing masks have additional valves to the partial rebreathing masks. The valves allow unidirectional flow of gases. The flutter valves on the side ports prevent room air entrainment. The exhaled gases are prevented from entering the reservoir bag by incorporating a valve between the mask and the reservoir bag. It can provide the highest FiO2of 0.9 to 1.0 without intubation at fresh gas flow of 12 – 15 L/min. Prolonged use can be uncomfortable for the patient as it requires a tight seal and the entire equipment is heavy. Malfunction of the equipment may lead to CO2 build up and suffocation. The high flow oxygen device includes venture masks, which are widely used. The advantage of this equipment is that the exact FiO2 being delivered by the device is known. FiO2 depends on the construction of the device and the fresh gas flow. The mechanism of action is usually incorrectly quoted depending on the venturi effect. The mechanism of action depends on the principle of air entrainment.Air entrainment occurs as a consequence of fluid viscosity. The viscous shearing force that exists between moving and static layers of fluid causes the non-moving fluid to be dragged into the moving stream [6Scacci R. Air entrainment masks: jet mixing is how they work; the Venturi and Bernoulli principles are how they don’t. Respir Care 1979; 24: 928-31.]. Two models are available: a fixed FiO2 model which requires specific inspiratory attachments that are colour coded and have labelled jets that produce a known FiO2 with a given flow. Maximum is with green which provides a FiO2of 60% followed by red, yellow, orange, white, blue delivering a FiO2 of 40%, 35%, 31%, 28%, and 24% respectively. A variable FiO2 model has a graded adjustment of the air entrainment port that can be set to allow variation in delivered FiO2. These are not colour coed as such. Oxygen hood is a high flow device, used to deliver oxygen in infants. It is a plastic hood that surrounds the baby’s head with an opening for the neck. This device is useful in infants requiring more than 40% oxygen. Oxygen delivered by this method should be warmed and humidified. The total flow must be more than 10 L/min to prevent CO2 accumulation. Desired oxygen concentration can be achieved by combining the flow of oxygen and air. The oxygen delivered needs to be humidified and warmed. Probable complications of oxygen hood include hypoxemia, hyperoxaemia, hyperthermia, hypothermia, irritation and pain in the neck. High flow nasal oxygen therapy comprises an air/ oxygen blender, an active heated humidifier, a single heated circuit, and a nasal cannula. At the air/oxygen blender, the inspiratory fraction of oxygen (FIO2) is set from 0.21 to 1.0 [7Nishimura M. High-flow nasal cannula oxygen therapy in adults. J Intensive Care 2015; 3(1): 15. [http://dx.doi.org/10.1186/s40560-015-0084-5] [PMID: 25866645] ]. A high-flow nasal cannula (HFNC) delivers a flow rate up to 8 L/min in infants and 60 L/min in adults [8Spoletini G, Alotaibi M, Blasi F, Hill NS. Heated humidified high-flow nasal oxygen in adults. Chest 2015; 148(1): 253-61. [http://dx.doi.org/10.1378/chest.14-2871] [PMID: 25742321] ].The gas is heated and humidified with the active humidifier and delivered through the heated circuit. It is considered to have a number of physiological effects: reduction of anatomical dead space, PEEP effect, constant fraction of inspired oxygen, and good humidification [7Nishimura M. High-flow nasal cannula oxygen therapy in adults. J Intensive Care 2015; 3(1): 15. [http://dx.doi.org/10.1186/s40560-015-0084-5] [PMID: 25866645] ]. It has become a standard of care in several clinical situations for infants, children, and preterm neonates. By virtue of a number of physiologic benefits over conventional oxygen therapy, including greater comfort and tolerance, more-effective oxygenation in some circumstances, and improved breathing pattern with increased tidal volume and decreased respiratory rate and dyspnea, we are now seeing increasing use for adults [8Spoletini G, Alotaibi M, Blasi F, Hill NS. Heated humidified high-flow nasal oxygen in adults. Chest 2015; 148(1): 253-61. In order to make an optimal choice of oxygen delivery, few basic principles need to be understood and then oxygen is prescribed using an appropriate delivery device. The very first thing to consider is the patient’s status. In patients who are relatively stable but at risk of type 2 respiratory failure, due to underlying lung or systemic pathology, then the target oxygen saturation should be 88-92% and titrate the oxygen dosage appropriately. Inappropriate high flow and high saturation in these patients can be deleterious, increasing both mortality and morbidity, whereas titrated oxygen delivery is proven to have significantly reduced mortality, hypercapnia, and respiratory acidosis [1Austin MA, Wills KE, Blizzard L, Walters EH, Wood-Baker R. Effect of high flow oxygen on mortality in chronic obstructive pulmonary disease patients in prehospital setting: randomised controlled trial. BMJ 2010; 341: c5462. [http://dx.doi.org/10.1136/bmj.c5462] [PMID: 20959284] , 2Abdelsalam M, Cheifetz IM. Goal-directed therapy for severely hypoxic patients with acute respiratory distress syndrome: permissive hypoxemia. Respir Care 2010; 55(11): 1483-90. [PMID: 20979676] ].These patients are ideally treated by starting off with a fixed flow oxygen delivery device which can provide reliable and predictable FiO2, thus ideally started off with blue or white venturi while maintaining patient arterial oxygen saturation (SpO2) of 88-92%. And then titrating the oxygen to lowest dose of FiO2while maintaining the target SpO2. For patients who are not at risk of type 2 respiratory failure and requiring oxygen therapy because of hypoxemia, the target should be to maintain a SpO2 of 94-98%. Such patients who present initial severe hypoxemia with SpO2 less than 85%, they should be started with high flow oxygen of 10-15 L/min through reservoir mask. Others who are is relatively better with SpO2 85-94% can be started with low flow device such as nasal cannula @ 2-6 L/min or simple face mask @ 5-10 L/min and titrated ±2L/min thereafter to maintain the target SpO2. 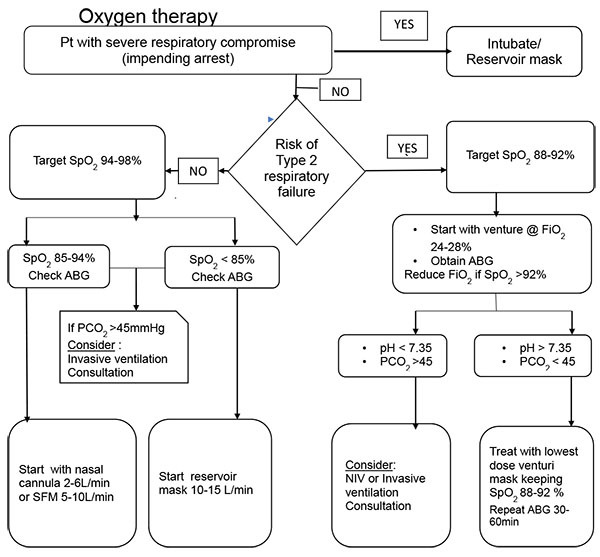 Other than the target SpO2 described in various conditions, permissive hypoxemia is a relatively new strategy for maintaining SpO2 of 82-88% in critically ill patients to improve outcomes [2Abdelsalam M, Cheifetz IM. Goal-directed therapy for severely hypoxic patients with acute respiratory distress syndrome: permissive hypoxemia. Respir Care 2010; 55(11): 1483-90. [PMID: 20979676] -5Conte BM, L’hermite JM, Ripart J, Lefrant J. Perioperative optimization of oxygen delivery. Transfus Altern Transfus Med 2010; 11(3): 22-9. The oxygen should be treated as a drug and care should be taken while prescribing it. Clear targets should be kept in mind when choosing appropriate oxygen therapy and delivery devices to avoid the harms associated with excessive and inadequate oxygenation Fig. (1 ). Despite changes in target, the basis of choosing the delivery devices and flow rate titration remain the same..
Flow algorithm for management of hypoxemic patient -Oxygen therapy. ABG, arterial blood gas; FIO2, fraction of inspired oxygen, SpO2, arterial oxygen saturation measured by pulse oximetry. Austin MA, Wills KE, Blizzard L, Walters EH, Wood-Baker R. Effect of high flow oxygen on mortality in chronic obstructive pulmonary disease patients in prehospital setting: randomised controlled trial. BMJ 2010; 341: c5462. Abdelsalam M, Cheifetz IM. Goal-directed therapy for severely hypoxic patients with acute respiratory distress syndrome: permissive hypoxemia. Respir Care 2010; 55(11): 1483-90. Girardis M, Busani S, Damiani E, et al. Effect of conservative vs conventional oxygen therapy on mortality among patients in an intensive care unit. The oxygen-icu randomized clinical trial. JAMA 2016; 316(15): 1583-9. John E, Heffner JE. Story of Oxygen Respiratory Care 2013; 58: 18-31. Conte BM, L’hermite JM, Ripart J, Lefrant J. Perioperative optimization of oxygen delivery. Transfus Altern Transfus Med 2010; 11(3): 22-9. Scacci R. Air entrainment masks: jet mixing is how they work; the Venturi and Bernoulli principles are how they don’t. Respir Care 1979; 24: 928-31. Nishimura M. High-flow nasal cannula oxygen therapy in adults. J Intensive Care 2015; 3(1): 15. Spoletini G, Alotaibi M, Blasi F, Hill NS. Heated humidified high-flow nasal oxygen in adults. Chest 2015; 148(1): 253-61.